Stamps Ahead: Let this day begin....Disneyland here I come. Another layout completed for the cybercrop over at Scrappingclearly share and inspire facebook group. 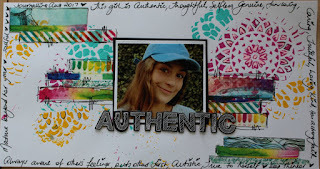 This was for a scraplift challenge with a layout by Marelle Jackman in at 6" x 12" layout format. 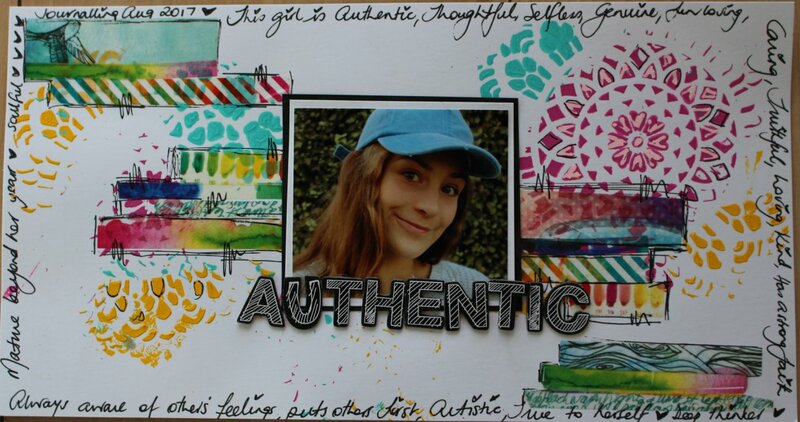 I was drawn to the mixed media elements especially the paints and colourful layout. I started out attempting a 6" x 12" layout however I just could not come to grips with it, so I added this smaller piece to a piece of red CS. My photo was taken just prior to leaving my hotel and heading for Disneyland for the day. Here is a close up of my detail in the middle piece. I love the transparency of the paint over my inked background of heart shaped bubble wrap. Thank you for looking, have a great day. Margaret.